Witness how Bio-adaptive lighting can transform care environments for residents, staff and operators. Previously the preserve of expensive and complex technology, a new standard of intelligent control systems and advanced lights now makes it possible to install and manage circadian-supportive lighting in buildings of all sizes. amBX Smart Core is a leading intelligent system designed for sophisticated lighting control but with easy-to use and even automatic delivery of correct lighting for care environments. amBX is a UK developer of intelligent lighting control systems with experience of hundreds of installations in more than 16 countries. Smart Core is a new generation of smart control systems that brings real intelligence to smart and advanced lighting. The Bio-enhance lights from Swann Lighting in the UK are designed to deliver the widest spectrum of colour required for true circadian-supportive lighting. The range of luminaires are all capable of producing the precise colour required at certain times of day and in specific environments to ensure that human circadian cycles are supported and maintained without disruption. 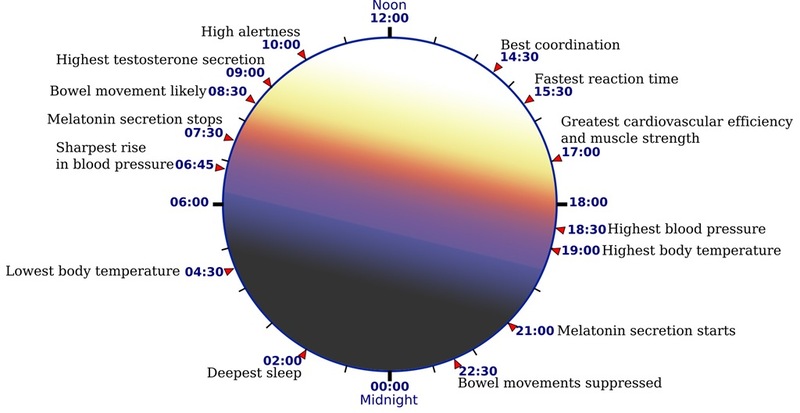 By controlling the body`s circadian system, light impacts outcomes in healthcare settings by reducing depression among patients, decreasing length of stay in hospitals, improving sleep and circadian rhythm, lessening agitation among dementia patients, easing pain, and improving adjustment to night-shift work among staff. These outcomes are now possible with efficient and intelligent lighting with full spectrum capability. Sun-Light Solutions are proud to be exhibiting at this years Essential Install Live exhibition at Sandown Park Racecourse 10th & 11th of May 2017. 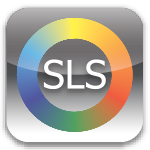 SLS will be exhibiting the “coolest lighting controller on the planet” the amBX Light-Scene Engine, offering audio & video to light effects along with much more from the multi-Space lighting control system. We are also looking to impress with the company’s brand new product. A range of attractive, bespoke hand blown glass chandeliers designed and produced in the UK. Building on over thirty-years’ experience of working with blown glass, the chandeliers are illuminated by LED modules and can be white, warm white, colour tuneable, RGB or RGBW and can also be controlled in a number of ways. Each piece can be controlled together so that the whole chandelier is the same colour or SLS can enable a unique amBX experience, where the company designs the chandelier to be divided up into different sections allowing for lighting effects flowing throughout the length of the chandelier. The lights can be controlled to music or video feeds or a series of beautifully designed ambient light scenes can viewed in the chandelier. In addition, SLS will be showing the Digital Light Surface, offering animated art from digital light for any environment. Find out more on Stand 143. 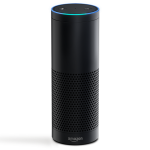 Sun-Light Solutions delivers Amazon Echo integration to amBX. Sun-Light Solutions integrators can now leverage the Alexa Voice Service to provide next generation voice control of amBX Light Scene Engine. Setting new standards of intelligent lighting control for today’s most demanding projects. amBX Light-Scene Engine, the IP based, multi-room lighting control engine has been designed and developed to transport intelligent and intuitive lighting control to new levels. 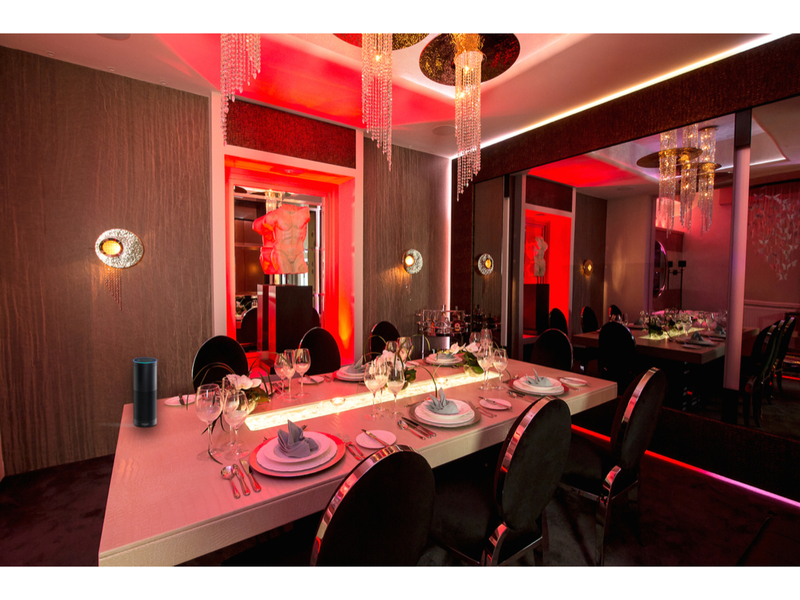 Along with third party control via the likes of AMX, Crestron, Control4, DemoPad, Lutron QS and bespoke apps from Sun-Light Solutions the addition of Alexa Voice Control takes control to new levels of integration through to the connected home and business. Fully customise amBX scenes to a clients lifestyle, is made very easily once set up, just speak the words and your amBX will respond immediately, offering unparalleled simplicity, power, customisation and delivery. Sun Light Solutions announces new integration capability for Lutron Homeworks QS with amBX Lighting Control. 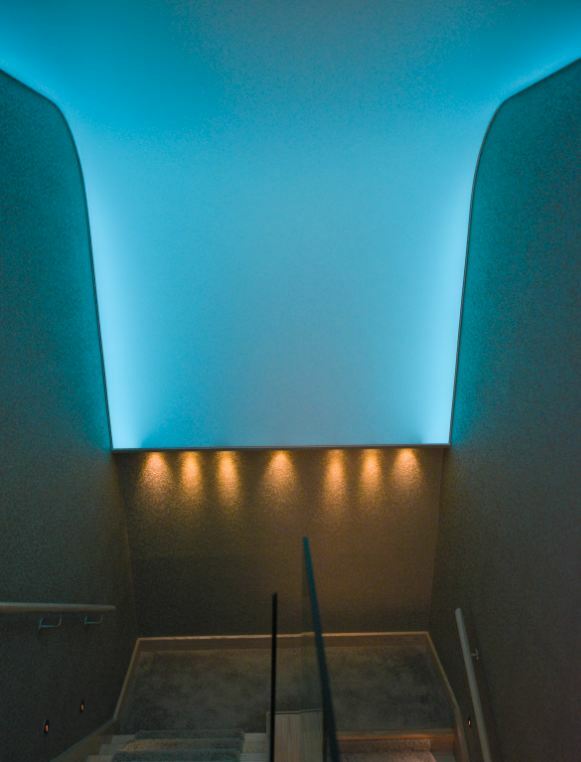 SunLight Solutions and the manufacturer amBX, announce the availability of a new integration driver for the market-leading Lutron Homeworks QS system with the amBX lighting effects generator and can be seen on demonstration at the magnificent Pulse Cinema showrooms (image below) in Stansted, UK. 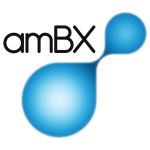 The amBX integration driver was created for SLS by Andy Casey of DemoPad. Andy has many years experience with Lutron technology and has an in-depth knowledge of the amBX solutions, so the Lutron developments were a natural progresion. This latest development allows full integration of amBX Light-Scene Engine into a Lutron Homeworks QS system and opens up the entire dynamic and interactive lighting experiences possible from the amBX system. The world of mood, ambience, entertainment and coloured lighting effects are now available with this new and exciting addition, being easy to integrate into the Lutron QS for the installers and easy control by the user. 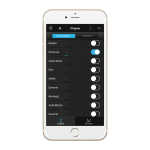 amBX Light-Scene Engine works with any number of DMX controlled lights and now, designs and installations based on Lutron QS will no longer be restricted to a limited capability of this type of lighting. Whether it’s for a single room or to add a deeper ambience to multiple spaces, a new range of possibilities with lighting is now achievable within a Lutron QS system. Call Sun Light Solutions on +44 (0)7887 634990 to become involved. Showing amBX connected lighting for the residential market at this central London event. Interior Design today, goes beyond deciding the colours of the walls, the type of flooring a house will have, or what the soft furnishings and curtains will look like. Designing the interior of a home is designing a life style. Knowing how to include into this vision all audiovisual equipment and the wonders it can offer, is as essential as taking into account the plumbing and heating. Changing the mood of a room through the clever programming of its lighting, is a must for the modern interior design. An insight on how hard and soft surfaces might influence the acoustics of a room, could make or break an immersive sound setting. And finally, the much talked about Internet of Things (IoT), which is changing the way we live. IoT is more than all equipment and appliances in the home communicating with each other and working together. Interconnectivity allows interiors to learn about their inhabitants becoming intelligent and an integral part of life. 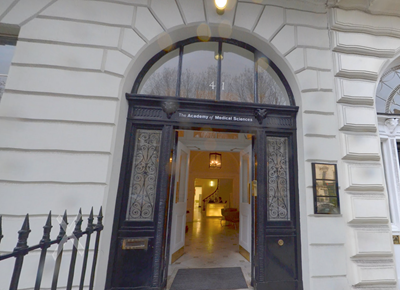 At ‘The Intelligent Interior,’ a group of top specialist will share their knowledge and experiences in the subject. This is a must attend event for all interior designers, architects, consultants and specifiers that not only want to offer value add to their clients, but also want to stay ahead of the crowd. IP Connected Keypad Controllers for amBX Lighting. Sun-Light Solutions has partnered with SY Electronics to provide simple but effective, Ethernet wall/furniture switches to control the amBX Light-Scene Engine. The wall switches are a smart advancement for connected lighting, allowing the lighting scene required to be selected as you enter the room. Or the switches can be built into furniture such as a lectern, podium, credenza etc. The SY-KP Series Keypad Controllers provide a complete range of simple to use and easy to install Keypads for media displays and associated AV equipment control which now has the ability to control the lighting scene and brightness selection of amBX lighting controls. The SY Keypad Controllers feature soft touch buttons and a host of device connection ports suitable for all common and many more advanced applications. The SY Keypad Controllers feature ethernet, bi-directional serial or infra-red ports, input detection ports, output ports for relay control, USB configuration, and low voltage power making them the most powerful devices available in their class. The SY Device Suite software provides a powerful yet easy-to-use tool for configuring the SY-KP Series Controllers to respond just the way you want. The amBX module is now added to the Device Suite library for easy integration. Each button on the SY Keypad Controllers features a tri-colour LED to allow feedback colour or state to be programmed or change on receipt of information back from the bi-directional serial ports. 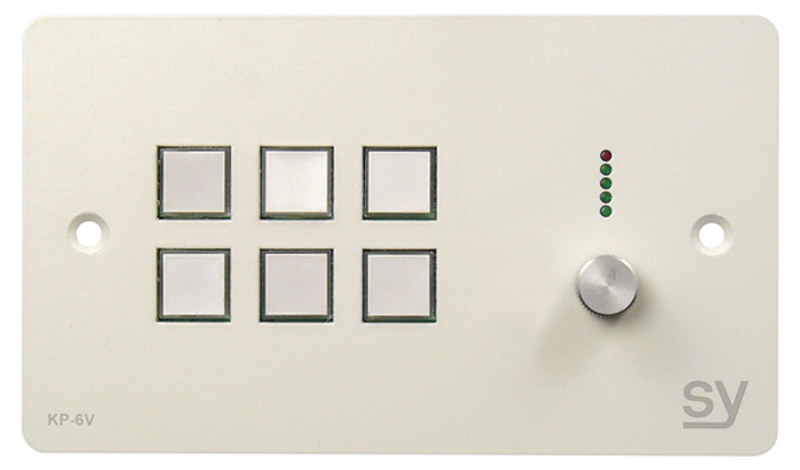 With a range of Keypad Controllers available ‘V’ models also feature a Rotary Volume Control, which acts as a brightness control for amBX, with level indication derived directly from the device being controlled. For the user each button can be programmed to perform multiple functions and is the ideal solution to replace multiple handsets whilst providing a permanent location for the point of control, saving lost or misplaced handsets and there’s no more running out of batteries just when you need the system to work. The SY Keypad Controllers also fit in standard UK and European size back boxes and are supplied in a modern smooth matt white finish that is resistant to finger marks yet easily wiped clean and aluminium finish. Sun-Light Solutions takes amBX into the future. 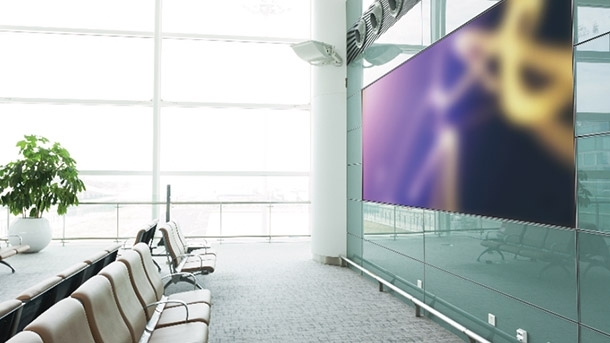 amBX has reaffirmed their partnership with Sun-Light Solutions as its exclusive Distributor for the AV & Custom Install market in the UK & Europe. Following a successful few years which has seen the introduction of a new generation of amBX lighting control technology, Sun-Light Solutions will continue to support dealers looking to deliver the unique capabilities of amBX to add value to their projects and client experience. Neil MacDonald, COO of amBX says “SLS have done a great job for us in supporting the channel and we are delighted to have affirmed the continuation of the partnership. We recognise the critical need for understanding what the channel and installers need and Kevin brings that to amBX through our partnership”. We understand that every space demands a unique atmosphere and realise that many spaces are truly uninspiring. 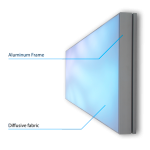 Which is why we deliver the Digital Light Surface. The new medium for creating animated artwork from digital light, in any environment. The principle of bio-adaptive lighting is to provide artificial light controlled in such a way as to match the needs of human biological cycles, or circadian rhythms, in the most effective and appropriate way. It provides for improved health and wellbeing and supports aspects of human behaviour that benefit from varied and changeable lighting. amBX have harnessed this in a single Circadian Light-Scene, lasting some 24hours. 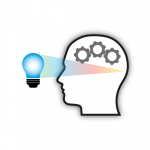 Understanding of the impact of light on human behaviour has advanced rapidly at the same time as lighting technology has undergone a major evolution with the advent of LED lighting. It is now possible to use the principles of bio-adaptive lighting easily and cost-effectively in the workplace, at home and especially in sensitive environments such as schools and healthcare environments. A universal requirement for effective use of lighting in these areas is intelligent lighting control and especially easy-to-use interfaces for operators and individuals. That’s where amBX delivers a powerful and flexible control system that enables the positoive benefits of lighting to be used in practical ways and for huge benefits. Please see here – http://sun-lightsolutions.com/our-products/bio-adaptive-lighting/ or make contact with Sun-Light Solutions to find out more. Sun-Light Solutions creates the Control4 Driver Module for amBX LSE. Collaboration between Sun-Light Solutions, Chowmain NZ & amBX UK delivers the Control4 driver module for the amBX Light-Scene Engine, the IP based DMX LED lighting control system, famous for controlling lights to video and audio content for cinema, media rooms etc. The new generation amBX is a hugely extended & scalable system, perfect for controlling lights within multiple spaces (up-to 32 spaces) in the home, office, meeting rooms, classrooms, teaching spaces, event spaces, bars, clubs and restaurants amongst many others – Offering multi DMX universe support for the larger systems. o Driver will turn on the current scene and off scenes that are not on for that space.